Cakey's favourite book at the moment is 'Dora saves Mermaid Kingdom' (sigh!). Because of this book Cakey wanted to make a mermaid. 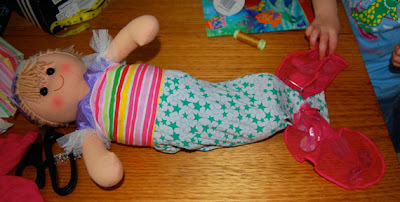 I decided the easiest way to do that was to turn one of her dolls into a mermaid. I am terrible at sewing, in fact sewing machines cry out in fear as they see me approaching.... my sewing skills are limited to pinning and tacking. Anything more complicated gets handed over to the collective grandmothers. Anyway out came the sewing kit which is a completely disorganised fishing tackle box full of the things 3 year olds love – buttons, ribbon and a measuring tape. I found an old pair of Boo's baby leggings to use for the tail. 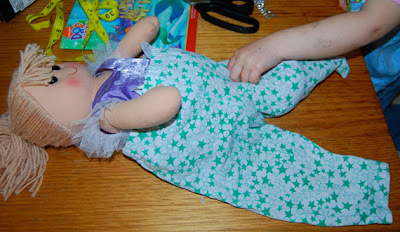 We stuffed the doll's legs down one side and then pinned (with safety pins) the empty leg behind her. To stop the tail falling off, I tightly tied a scrap of rainbow material around the doll's waist. To make her tail fins I cut off the wings of an old fairy t-shirt and pinned them to the bottom of the tail with safety pins. Any colourful material cut in a triangular shape for the tail fins will do though. Cakey wanted her new mermaid to have a crown, luckily for me this doll came with a headband we could use (try making one with some ribbon). We had some decorative plastic silver beading that Boo had recently ripped off another doll so we sewed it onto the headband to make it 'sparkly'. Cakey had a go at threading the needle in and out of the headband fabric and was very pleased that she didn't prick her finger with the needle. 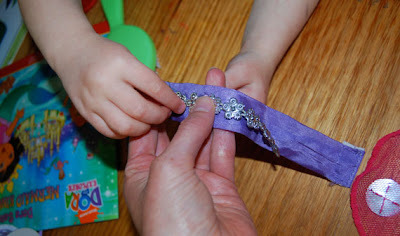 Last but not least, we used up the leftover sparkly silver bits and bobs to make bracelets – very simply sticky taped on (have I told you how much I love sticky tape!!). Now we have one mermaid that has a permanent place on Cakey's bed. 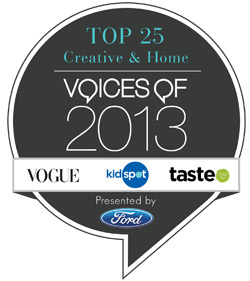 Let's hope my dodgy sewing holds! Ooo very clever. 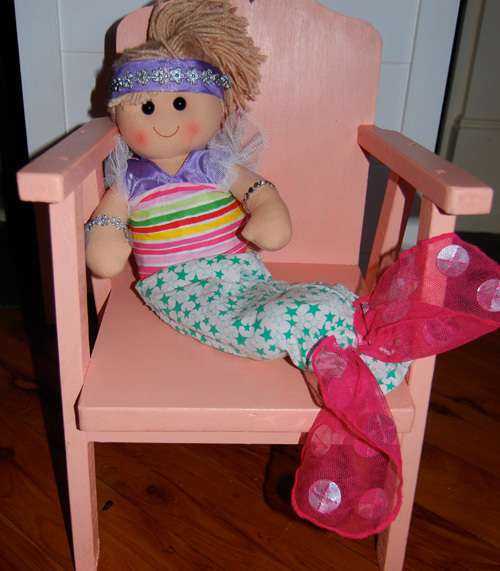 Love the mermaid and the sewing skills. 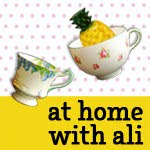 I have recently acquired a sewing machine but am yet to create, just practising and phaffing at the moment. This is SOOOOO cute!! I love it!! How adorable. Brilliant- such an easy idea.